If you're looking to round out your portfolio with some smaller companies this year, these five mid-caps are good bets. While much attention is paid to the megacompanies worth hundreds of billions of dollars, mid-cap stocks, those valued between $2 billion and $10 billion, can often be even more lucrative for investors. Most aren't followed nearly as closely, increasing the odds that a bargain will emerge. We asked five of our contributors to detail a mid-cap stock that would make a perfect addition to anyone's portfolio in January. Here's why Arconic (NYSE:ARNC), Royal Gold (NASDAQ:RGLD), Buffalo Wild Wings (NASDAQ:BWLD), Bed Bath & Beyond (NASDAQ:BBBY), and Leucadia National Corp. (NYSE:JEF) are their bets. Tyler Crowe (Arconic): The breakup of Arconic and Alcoa is one of the lesser-discussed business stories this past year. Coincidentally and for reasons I'll outline below, this makes Arconic an attractive mid-cap stock that is at least worth a look. Post-split, Arconic is now a company that focuses solely on manufactured and value-add products mostly using aluminum and a few other lightweight alloys. This is a unique industry to be in for the coming years as demand for strong-but-lightweight products in the aerospace industry takes off. Since the beginning of 2015, Arconic has signed about $11 billion in supply contracts with the aerospace industry and currently boasts a nine-year order backlog for products. As icing on the cake, it just so happens that its engineered product business -- the part of the business where these deals reside -- has the company's highest EBITDA margins, about 20%. As a newly independent company, it has a less-than-stellar balance sheet, but there is an intangible worth considering here. As part of the breakup, it retained a 19% stake in the legacy Alcoa business, which it plans to monetize over time to pay down debt or buy back stock. 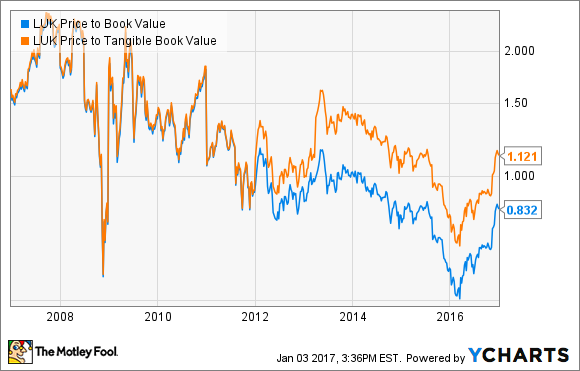 There does appear to be much going for Arconic, the company's stock trades at a reasonable enterprise-value-to-EBITDA ratio of 7.4 times and its price-to-tangible-book value is an even more attractive 1.4. If the company can continue to generate strong returns on its growing aerospace business while making some modest headways into other markets such as automotive, then Arconic looks like an attractive mid-cap stock. Neha Chamaria (Royal Gold): I'm rooting for Royal Gold this month as my top mid-cap stock. While no one really knows where gold is headed, Royal Gold can give investors exposure to the precious metal at low risk as it can generate higher margins and cash flows than traditional miners even when gold prices are weak thanks to its business model. Instead of mining gold, Royal Gold buys precious metal "streams" from other miners at prices substantially below spot rates in exchange for funding them. So, for example, Royal Gold generated revenue worth $117.9 million against its bullion purchase cost of only $22.7 million during its fiscal first quarter ended Sept. 30, 2016. Not surprisingly, Royal Gold's revenue and earnings per share hit record highs during the quarter. I believe that solid first-quarter performance positions Royal Gold for a strong year ahead. The streamer also raised its dividend by 4.4% this past November, marking its 16th straight year of dividend increases. Again, you can thank Royal Gold's low-cost, high-margin business for the strong growth in dividends. The stock's yield of 1.4% might not be the best in the industry, but stable cash flows and dividends makes the stock one of the most attractive options if you want exposure to gold. Steve Symington (Buffalo Wild Wings): Shares of Buffalo Wild Wings are trading at almost exactly where they started 2016 as of this writing. But the casual-dining restaurant chain is enjoying the momentum of both a favorable political climate and its strong third-quarter 2016 report in October. Regarding the latter, Buffalo Wild Wings demonstrated signs of improvement as quarterly revenue climbed 8.5% year over year, to $494.2 million, as contributions from new restaurants more than offset same-store sales declines of 1.8% at company-owned locations and 1.6% at franchised restaurants. But while its comps performance might not seem impressive at first glance -- this marked its third straight quarter of comps declines, after all -- I pointed out at the time that those figures represented marked improvements over the previous two quarters. To be sure, Buffalo Wild Wings is seeing promising early results from traffic-driving initiatives including its new 15-minute FastBreak lunch guarantee, and Half-Price Wing Tuesdays. Buffalo Wild Wings also rolled out a new menu and new burgers in November to keep diners interested and coming back for more, and its popular Blazin' rewards loyalty program (which typically lifts same-store sales around 2% following its initial rollout) has a long runway for growth as it had only been rolled out in 25% of U.S. locations as of the end of last quarter. In addition, the market drove up shares in November given the impending arrival of a new president whom many expect will take a generally hands-off approach to minimum wage hikes. More specifically, President-elect Donald Trump will likely leave any hikes up to states' discretion rather than impose a federally mandated minimum wage increase, and casual restaurant chains like Buffalo Wild Wings are the obvious beneficiaries. With shares having pulled back around 7% over the past month as of this writing, I think now is a great time for long-term investors to open or add to a position in Buffalo Wild Wings. Tim Green (Bed Bath & Beyond): Retailer Bed Bath & Beyond has been struggling with slumping profits for years. Operating margin, which peaked at 16.5% in fiscal 2012, has dropped to just 10.6% over the past 12 months. Share buybacks have helped keep the company's per-share earnings from falling, but that trick can't go on forever. Bed Bath & Beyond has become highly dependent on sending out coupons, compelling its customers to visit a store with the promise of 20% off. Heavy coupon usage is at least partly to blame for the company's slumping margins, and management is now testing out a membership program in an effort to move away from these margin-killing deals. Despite the problems facing the company, Bed Bath & Beyond is still exceptionally profitable. The days of operating margins in the mid-teens may be in the past, especially with online retailers breathing down the company's neck. But Bed Bath & Beyond is still one of the better brick-and-mortar retailers around. The company expects to produce somewhere around $4.50 in per-share earnings this year, putting its P/E ratio at just 9. Some pessimism is certainly warranted, but the market is betting that things will continue to go very wrong for Bed Bath & Beyond. Any outcome better than awful could send the stock much higher, making January a great time to buy. Jason Hall (Leucadia National Corp.): If you only look at earnings, Leucadia National Corp. shares look very expensive, trading at a price-to-earnings multiple of over 200. However, this is where it's important to look at the details that make the bigger picture. First off, Leucadia is coming out of a tough period for more than one of the conglomerate's key holdings, including National Beef and Jefferies, which has depressed profits over the past couple of years. The good news is that National Beef seems to have largely recovered, while there's a lot of reason to see a bright future for the investment banking opportunities at Jefferies. LUK price-to-book value data by YCharts. There's recent evidence, too. Only a few weeks back, Leucadia announced it was selling Conwed, a small plastics business, for $295 million plus up to $40 million in bonus payments. This is a tidy sum, considering that Leucadia's net investment in Conwed through the end of last quarter was only $104 million. But here's the kicker: Only $46 million of that investment was tangible book value. If this one sale is any indication, there's probably significantly more value in Leucadia's assets than its current book value reflects. If you're looking for a solid company trading at a steep discount to the value of its assets, Leucadia National could be an ideal mid-cap stock to buy right now.